The Longhope Lifeboat Museum is an outstanding example of what can be achieved by volunteers coming together to preserve a fascinating and pivotal - and at times tragic - element of the area's identity and heritage. Because it takes an extra effort for visitors to Orkney to make their way to Hoy we get the sense that the southern islands are often quieter than Orkney's Mainland. 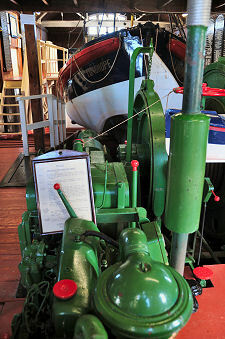 Whatever you do, if you have decided to take in the very different atmosphere of Hoy and South Walls, make sure you allow time between ferries to visit the Longhope Lifeboat Museum. The road from Lyness on Hoy to Longhope passes around the head of the narrow-mouthed North Bay, an offshoot of Scapa Flow. As it does so it passes over the Ayre, which links Hoy with the neighbouring island of South Walls. South Walls was originally a tidal island, until a causeway was built across the Ayre in WWII, making the link permanent. The replacement lifeboat station was the one pictured on this page. 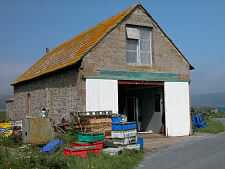 To reach it you take the minor road that runs past the end of the 1874 shed and along the south west shore of Aith Hope. The road comes to an end at a turning place next to the lifeboat station, a little under half a mile from the junction with the main road. To say you can't miss the station is an understatement. 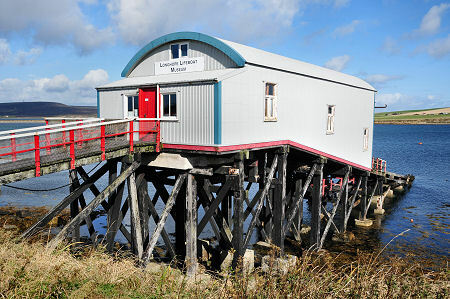 The lifeboat station you see today, which is now home to the Longhope Lifeboat Museum, cost £2,700 to build in 1906. 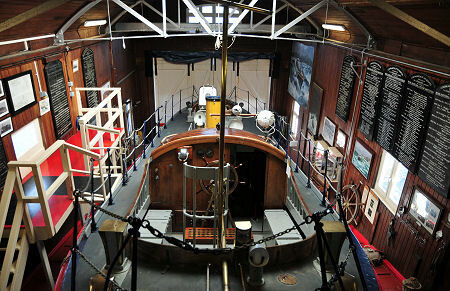 It continued to serve as the base for the Longhope lifeboat until 1999. In August of that year an Arun-class lifeboat, Sir Max Aitken II became the Longhope lifeboat. This class was designed to stay permanently afloat, and the decision was taken to move her to purpose-built moorings at Longhope pier. 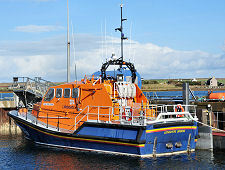 The lifeboats that have served here since have also been stationed at Longhope, including the current vessel the Helen Comrie and her predecessor The Queen Mother, which was based here between 2004 and 2006. This could so easily have left the 1906 lifeboat station redundant. 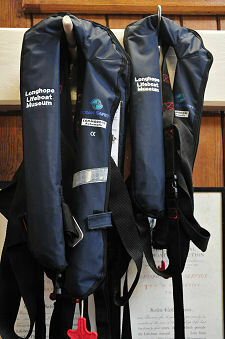 Instead, the decision was taken to develop a museum celebrating and commemorating Longhope's lifeboat heritage. A lifeboat station without a lifeboat is little more than an empty shell, but this was quickly resolved. 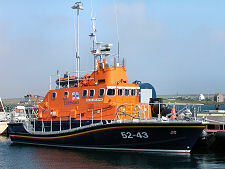 The longest-serving lifeboat at Longhope had been the Thomas McCunn. She had been stationed here between 1933 and 1962, and during that time she had been launched from the lifeboat station 101 times to tackle emergencies (and many more times in training) and saved 308 lives. Thomas McCunn went on to serve as a reserve lifeboat until 1972, and was then sold to a private owner in the south of England. In 2001 she was bought for the sum of £1 from her owner. Between 29 July 2001 and 7 August 2001 she sailed back from Hayling Island in Hampshire to Longhope, calling in at eight east coast lifeboat stations en route. She has lived at the lifeboat station on Aith Hope ever since. She is still occasionally launched, and is available for film and TV work. 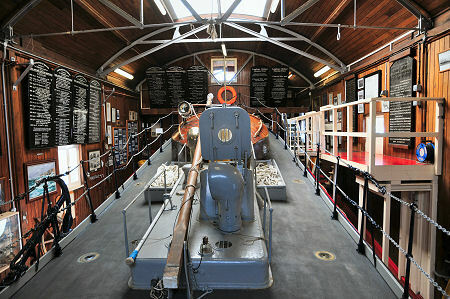 The Longhope Lifeboat Museum was officially opened by the Princess Royal on 28 May 2002. For anyone over a certain age, the phrase "Longhope lifeboat" will always have a tragic edge to it. 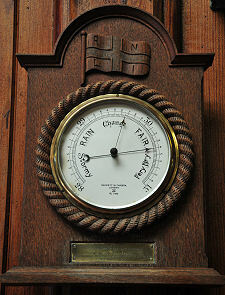 It was from the lifeboat station that now houses the museum that the Longhope lifeboat T.G.B. was launched on the evening of 17 March 1969 into the teeth of a severe storm to assist a cargo vessel in difficulty to the east of South Ronaldsay. The S.S. Irene was a Liberian-registered ship with 17 crew en route from Granton to Norway. The S.S. Irene ended up running aground on the east coast of South Ronaldsay, where her crew was saved by coastguards using a breeches buoy. T.G.B., however, had simply disappeared and was no longer answering radio calls. At first light the following morning a huge search was launched. T.G.B. was eventually found floating upside-down off Hoy. 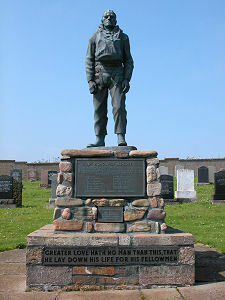 She was towed to Scrabster, where the bodies of seven of her eight crew were found within the lifeboat. The body of the eighth was never found. T.G.B. was a member of a class of lifeboats that was not designed to right themselves if they capsized. Estimates since have suggested that it would have taken an enormous wave to capsize the boat, but clearly she ran into just such a wave at the wrong time and in the wrong place. The seven crew members whose bodies had been recovered were buried at the Osmondwall Cemetery on South Walls. On 9 August 1970, HM the Queen Mother unveiled a memorial in the cemetery to the eight men who died, where it can be seen today. What adds further to the sense of tragedy is that while the whole crew of the T.G.B. lost their lives, the vessel itself was repaired (and made less prone to capsizing) and returned to service at Arranmore in Ireland. 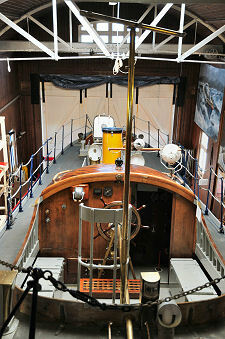 After retiring, she was purchased by the Scottish Maritime Museum and is on display at their museum in Irvine. Given the background of service and sacrifice by the lifeboat crews at Longhope dating back to 1874, it is not in the least surprising that the 1906 lifeboat station should have been turned into a museum: nor that such a wonderful job has been made of it. 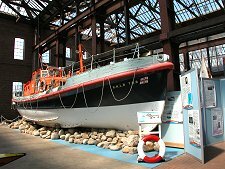 The star exhibit is of course the lifeboat Thomas McCunn, but the effort that has been put into every aspect of the maintenance of the building and the exhibits show just how much the Longhope lifeboats have meant to Longhope and to Hoy and South Walls more widely.